Full payment for special Stars is required prior to them being created. The mailing address for completed Stars if different from above. The information above shows how we wish the message note to read. Upon agreement of the addition to the message and the color(s) of paper, your donation for the Stars will need to be received via PayPal or check prior to them being created. Do not pay for the Specialty Star Order until you have submitted the order. if you are paying with PayPal, use the below cart. All orders must be placed through this order button. A confirmation that the order has been sent will appear on your screen. 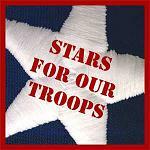 Within 24 hours, you will receive an email from Stars for our Troops confirming how your note will look and any questions we have. This is a 2 part process. Part 2 - Use any PayPal button if paying with PayPal or mail a check. You will be notified when we receive the complete order or part of an order. We hold all orders and/or payments for 14 days waiting for the missing part. Your information must fit into the space per line, 17 characters only. PayPal accepts credit and debit cards. It is a secure site. PayPal protects us from fraudulent charges and extra fees.